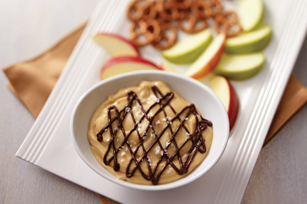 Try this Creamy Salted Caramel Spread with pretzels, apples and more! Our Creamy Salted Caramel Spread is ready in 25 minutes and makes up to 10 servings. Mix first 5 ingredients until blended; spoon into shallow serving dish. Drizzle with chocolate; sprinkle with salt. Serve with pretzel twists, and apple or pear slices. Prepare using BAKER'S White Chocolate or BAKER'S Bittersweet Chocolate. 10 servings, 2 Tbsp. each.